Did you know that Lower Manhattan’s South Street was at one time completely underwater? The island was largely uninhabited until Dutch settlers arrived in the Seventeenth Century. They recognized the potential of the magnificent harbor surrounding the territory, and they set to work using landfill to expand the island’s coastline. The Dutch were skilled shipbuilders and sailors. They built docks, and soon ferries were transporting passengers between what is now Manhattan, Brooklyn, Staten Island, and New Jersey. The water around the island was deep enough to accommodate the larger ships of that time, which made this an ideal location for world trade. 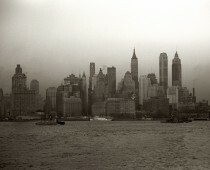 Later in the century when English settlers took control of the colony, New York Harbor became the busiest in the nation. It survived pirates, wars, and embargoes. Trade and commerce fluctuated throughout the centuries and peaked during the Nineteenth Century. The South Street area’s proximity to the harbor made it ideal for businesses, such as a variety of merchants, ship chandlers, sail makers, figurehead carvers, boarding houses, saloons, and even brothels. The seaport’s first counting houses were built beginning at the end of the Eighteenth Century. A “counting house” is what we recognize today as an office, shop, or warehouse. Prior to the counting house, business was conducted from within a person’s home. The fireproof counting houses built at the South Street Seaport were constructed of brick. When we think of Manhattan today, we think of its largest skyscrapers. In the early Nineteenth Century, Manhattan’s largest buildings were built out, not up. Schermerhorn Row, extending from Front Street to South Street on Fulton Street’s south side was one of Manhattan’s largest structures at its completion in 1812. This row of twelve brick warehouses has withstood the test of time and still exists among Lower Manhattan’s historically significant landmarks. Inevitably the size of ships increased, and the South Street Seaport could not accommodate these larger vessels and their new technologies. The area had gone into decline by the start of the Twentieth Century. The water was too shallow for the larger ships, and by the 1930s shipping had moved further up Manhattan’s West Side. Plans in 1966 to create a maritime museum inside Schermerhorn Row evolved into the formation of the South Street Seaport Museum in 1967, whose efforts have resulted in the historic district presently occupying the entire seaport area. Its purpose is to remind people of New York’s important maritime history. Many restorative projects as well as new development have contributed to the revitalization of the South Street Seaport, and while it is no longer the great port it once was, it is abuzz with shopping, restaurants, and of course, traces of its history. Baiter, R. A. (1975). Lower Manhattan waterfront: The special Battery Park City district, the special Manhattan landing development district, the special South Street Seaport district. New York: Office of Lower Manhattan Development. Baloga, V. E. (2010). Untitled 00 [Photograph]. Unpublished. Baloga, V. E. (2012). Untitled 01 [Photograph]. Unpublished. Baloga, V. E. (2012). Untitled 02 [Photograph]. Unpublished. Baloga, V. E. (2012). Untitled 03 [Photograph]. Unpublished. Baloga, V. E. (2012). Untitled 04 [Photograph]. Unpublished. Baloga, V. E. (2012). Untitled 05 [Photograph]. Unpublished. Baloga, V. E. (2012). Untitled 06 [Photograph]. Unpublished. Baloga, V. E. (2012). Untitled 07 [Photograph]. Unpublished. Rosebrock, E. F. (1975). Counting-house days in South Street. New York, NY: South Street Seaport Museum. White, E. B. (1999). Here is New York. New York: The Little Bookroom. Willis, C. (Ed.). (2002). The Lower Manhattan plan: The 1966 vision for downtown New York. New York, NY: Princeton Architectural Press. Workers of the Writers Program of the Work Projects Administration for the City of New York. (2004). A maritime history of new york. Brooklyn, New York: Going Coastal, Inc.